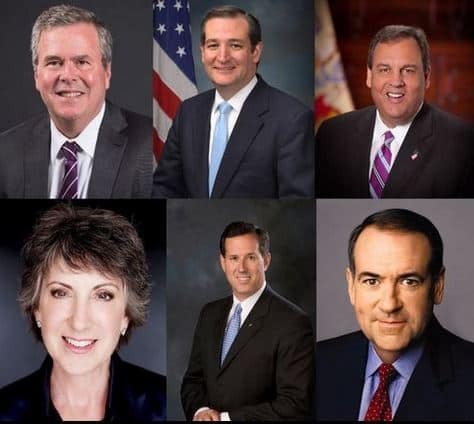 The leading GOP contenders for the 2016 White House race have spoken out about Indiana's new "religious freedom" law and the #BoycottIndiana backlash – with all candidates supporting the law to varying degrees. "The Fortune 500 is running shamelessly to endorse the radical gay marriage agenda over religious liberty to say: 'We will persecute a Christian pastor, a Catholic priest, a Jewish rabbi. "Any person of faith is subject to persecution if they dare disagree, if their religious faith parts way from their political commitment to gay marriage." The debate about gay marriage is really a debate about how the government bestows benefits and whether they should be bestowed equally. I believe they should. I also believe that people of religious conviction know that marriage is a religious institution with a spiritual foundation because only a man and a woman can create life, which is a gift that comes from God. We must protect their rights as well. I hope that we come to a place in this country where we are prepared to have respectful differences and tolerate those two views. Religious liberty and tolerance are too important to our country. It is frankly sad to me that politics has become a fact-free zone. It is sad that so many people on the left were quick to turn this into a divisive and destructive debate so they could further their own brand of identity politics. It is sad that CEOs took to Twitter before checking their facts, adding to the division instead of helping build tolerance. This debate represents what so many believe is wrong with our politics. It has taken an emotional issue for people on both sides and politicians have used it to divide and to score points with their team. It has been tough for some in the media to understand my position because I refuse to join the game of name calling and vitriol. Politics shouldn't be a game, however. We must find a way to respect one another, to celebrate a culture that protects religious freedom while condemning discrimination. At the Four Seasons in East Palo Alto, Mr. Bush was asked by an attendee to clarify his position. He said that he supported protecting religious freedom and that it must be done specifically in each state. “By the end of the week, I think Indiana will be in the right place, which is to say that we need in a big diverse country like America, we need to have space for people to act on their conscience, that it is a constitutional right that religious freedom is a core value of our country, “ Mr. Bush said. But “we shouldn’t discriminate based on sexual orientation,” he said. "In our state there's a balance between wanting to make sure that there's not discrimination [and] at the same time respecting religious freedoms. … We do that in different ways than what they've done in Indiana. "Certainly that's going to be part of the debate here and across the country." "I don't think Americans want to discriminate against anyone. I think the fundamental question in some of these laws is should someone be discriminated against because of their religious views? So no one here is saying it should be legal to deny someone service at a restaurant or a hotel because of their sexual orientation. I think that's a consensus view in America. The flip side of it is, though, should a photographer be punished for refusing to do a wedding that their faith teaches them is not one that is valid in the eyes of God." "Well, we should not have a situation where people perceive that anybody will be denied service. But, I can tell you this, I know Mike Pence, and he's got nothing but love in his heart for people and I just do not believe that in any way Mike Pence would intend for anything that happen in his state on his watch to be discriminatory towards any person," Christie said in a statement. "And so, my guess is that he'll fix the problem and move on," Christie said. "Because that's the kind of guy he is. I will tell you, amongst the governors, there is nobody that I've met amongst the governors who is more sincere in his faith and in his love for people than Mike Pence. So, I just don't believe any of this stuff is true and to the extent that something needs to be fixed to clarify that no one will be denied service for discriminatory reasons, I'm sure that's exactly what Mike will do." "If [the Left] manufactured as many products as they do crises like this one, which is an utterly phony attempt to create some kind of division, 92 million Americans who are jobless would have jobs. I've never seen anything so utterly off the mark in my life as trying to pretend that the RFRA law is actually discrimination. It is most certainly not. It simply gives you access to the court. And there's no guarantee that you're going to win when you go." "It is absolutely vital that we do all we can to allow Americans to practice their religious ways, while simultaneously ensuring that no one's beliefs infringe upon those of others. We should also serve as champions of freedom of religion throughout the world." "The only sensitivity training we need is to respect every person. Tolerance is the most misused word in the English language. Tolerance means you can say really horrible nasty things that I hate and offend me. That’s how we get along. You have a right to be mean — a right to be nasty to people. That’s how this country works, because we have thick skins and we aren’t offended. Should a gay or lesbian-owned printshop have to print signs for the Westboro Baptists that say ‘God hates fags’? Should a Jewish printshop have to make signs for the KKK? Should a kosher deli have to serve non-kosher food? It’s a two-way street. Tolerance is a two-way street. If you’re saying that ‘your religious liberties are not as important as my — fill in the blank,’ then I’ve got a problem with that." "Governor Perry has always fought to expand religious freedoms, which is why Texas became a beacon for liberty during his leadership. He believes it's up to the states and their leaders to determine what's in the best interests of their citizens,"
I will note that President Clinton signed the Religious Freedom and Restoration Act at the federal level and Secretary Hillary Clinton has now said she opposes this law. It would be interesting to learn if Secretary Hillary Clinton silently opposed this protection of religious liberty when President Clinton signed it, or if she has just recently ‘evolved’ on that. The great irony is that in the minds of today’s liberals the only bigotry to be tolerated is their own bigotry against religious beliefs. Rand Paul has yet to comment publicly on the situation.